Sweet Cheeks Adventures: McFarland USA out on June 2nd -- Review! 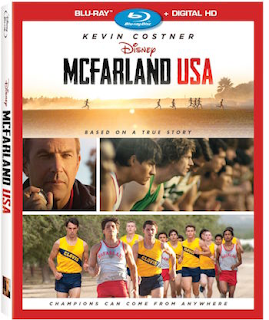 McFarland USA out on June 2nd -- Review! My husband and I sat down on Saturday night for a sneak peek of McFarland USA. I don't speak about my husband Jason too much on the site because he is very introvert, but I requested his help with this movie. At first he wasn't sure if he would like it. He informed me that he isn't a fan of Kevin Costner. WHO doesn't like Kevin Costner!!?? Let me tell you a little something else about my wonderful husband and Kevin Costner... Field of Dreams is his favorite movie. Can you recall the main character? KEVIN COSTNER!!! Oh, the insanity of my husband, but I digress. So, Jason wasn't too sure if he'd like this movie but I told him it is based on a true story and it has sports in it. He agreed to sit with me to watch it. He did bring a tablet though. Such shame! About 15 minutes into the movie, I saw his tablet go down and he was watching the movie! We made a fan out of him! I was enjoying the story quite a bit and come to find out... My husband did too! True stories have always touched my heart a little more than your usual movie, always bringing tears. I did cry a little with this one. I just get so proud and excited for the athletes involved! A little something I learned that actually is very relevant to my life right now, I learned about Quinceanera celebrations! With our recent move to Florida, I've heard a little bit about this celebration but the words didn't do justice for the pride and absolute fun that is expected to be had at a Quinceanera! I loved seeing this part of the movie! McFarland USA is available for purchase starting TODAY (June 2nd) so be sure to pick it up while you're out grabbing dinner!